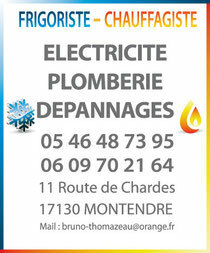 Mr. Bruno Thomazeau is a technician specialising in energy and climate systems. He is a holder of both water systems and electrical authorizations. A refrigeration and heating engineer, a plumber and electrician – he has all the necessary skills and qualifications to meet all your heating and refrigeration needs. We provide a technical service for your boiler maintenance, troubleshooting, and installation of all refrigeration, air conditioning, and heat pumps. A refrigeration specialist, such as Mr Thomazeau, is the only professional authorized to intervene and troubleshoot systems containing refrigeration. We offer all households and organizations a service of the highest quality that meets all legal and professional criteria, carried out with total respect for the environment. We are here to provide advice and individual attention and will be available to carry out your work with the minimum delay. Main d'oeuvre : taux horaire 50 € H.T. Pour toute intervention supérieure à 152 € : établissement d'un devis.